Ceiba 3: 103. 1952. TYPE: Nicaragua. Dept. of Jinotega: mountains cast of Jinotega, along trail to Cerro la Cruz, elev. 1,050-1,350 m. Standley 10255 (F, holotype; EAP, isotype). Terrestrial; stems thick, to 4 cm diam., leaf cars 4 cm wide; roots sparse, descending, tan; cataphylls coriaceous, 4-12 cm long, caudate and piculate at apex, drying yellow (B & K Yellow 1/10), persisting as moderately coarse longitutinal fibers. interprimary veins flat above, raised below; lesser veins scarcely visible; collective vein arising from the first basal vein or one of the primary lateral veins, 1-2.5 cm from margin, flat above, raised below. INFLORESCENCE erect-spreading; peduncle 20-67 cm long, 3-6 mm diam., slightly curved near base of spadix, shorter to longer than leaves; spathe green (B & K Green 6/2.5), subcoriaceous, narrowly ovate or boat-shaped, 8-15 cm long, 2-5 cm wide, broadest just above middle, long-acuminate at apex, de-current and clasping at base. inserted at 65°-80° angle on peduncle, held behind and hooding spadix; spadix pale green (B & K Green 7/2.5), glaucous, 6.5-12 cm long. 5-8 mm diam. at base, 4-5 mm diam. at apex, slightly curved just below middle so that the tip turns down; flowers 4-lobed, 2-3 mm long. 2.5-3.5 mm wide, the sides jaggedly sigmoid: 4-5 flowers visible in the principal spiral, 5-10 flowers visible in the alternate spiral; tepals matte, densely and minutely papillate, with droplets, lateral tepals 1.5 mm wide, the inner margin convex: pistils emergent, bright green; stigma slitlike with blunt papillae and a large droplet for 3 or 4 days before first stamens emerge; stamens emerging very slowly in a complete sequence from base. 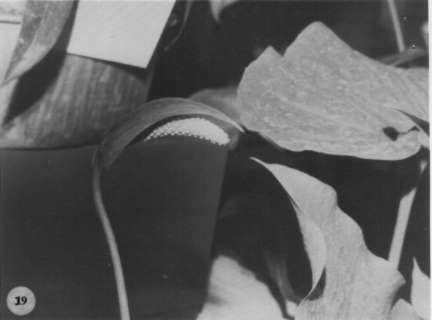 held in tight circle around pistil just above the tepals; anthers pale yellow, slanting over pistil before opening, ca. 0.6 mm long, 1.1 mm wide; thecae ellipsoid, somewhat divaricate: pollen pale yellow, fading white. pericarp thick, darker colored and lacking raphide cells near apex, numerous granular raphide cells in the lower half; mesocarp juicy, fragrant, sweet; seeds 1-2, semicircular to broadly ellipsoid, brown with numerous minuie granular projections on surface, flattened. 8-9 mm long, 8-9 mm wide, 3 mm thick, encased in a thin envelope. Figs. 18 and 19. Anthurium beltianum is endemic to central Nicaragua in the departments of Jinotega and Matagalpa at elevations of 1,000 to 1,500 m in premontane wet forest life zones, on limestone outcrops. The species was named in honor of the famous English naturalist Thomas Bell, author of the "The Naturalist in Nicaragua." 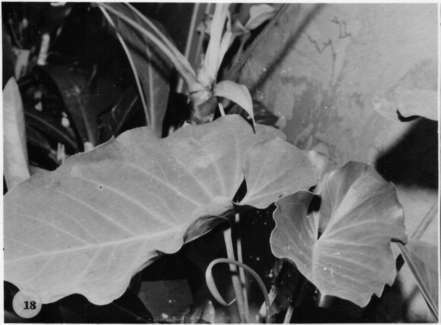 It is a member of section Calomystrium and is recognized by its moderately thick, ovate-cordate leaves with an obovate or hippocrepiform sinus, but especially by its semi-erect inflorescence with the moderately short, tapered, pale green spadix directed downward and by its lanceolate-elliptic to narrowly ovate spathe, which curves outward forming a protective covering above the spadix. Anthurium beltianum is similar to A. cotobrusii, which has generally similar leaves and inflorescences but does not have the hooded inflorescences of A. beltianum. Nicaragua Jinotega: 1000 m,, 7 Aug. 1977, Thomas B. Croat 43003 (MO). Nicaragua Jinotega:, , Standley 10255 (F). Nicaragua Jinotega:, , Standley 10359 (F). Nicaragua Jinotega:, , Standley 10883 (F). Nicaragua Jinotega:, , Williams et al. 24733 (F, G). Nicaragua Jinotega: 1400 m, 13.2N 85.55W, 7 May 1980, Stevens et al. 17029 (MO). Nicaragua Matagalpa: 1400 m,, 27 Nov. 1977, Neill 3020 (MO). Nicaragua Matagalpa: Cordillera Dariense, 1550 m,, 9 Apr. 1978, Neill 3452 (MO). Nicaragua Matagalpa: Cordillera Central de Nicaragua, 1400 m,, 18 Jan. 1965, Williams et al. 27887 (MO). Nicaragua Matagalpa: Valle Palcila, 1200-1300 m, 13.00N 85.56W, 20 Feb. 1981, Moreno 7039 (MO). Nicaragua Matagalpa: 1360-1380 m, 13.2N 85.55W, 7 May 1980, Stevens et al. 17081 (MO). Nicaragua Matagalpa: 1380 m, 13.02N 85.55W, 2 julio 1980, P.P. Moreno 1056 (MO). Nicaragua Matagalpa: 1380 m, 13.02N 85.55W, 2 julio 1980, P.P. Moreno 1057 (MO).